Monday in downtown Taipei, 10:14 p.m. The day is coming to an end for most people, but a group of young female ice hockey players have just begun a routine practice at Taipei Arena, home to the only standard rink in Taiwan. They are members of Taiwan's women's national ice hockey team, which stunned the world last month by finishing second in Group B of Division II of the 2018 Ice Hockey Women's World Championships. Having just qualified for Group B last year, Taiwan's team of mostly college students in their early 20s and a high school senior toppled Turkey, Romania, New Zealand and Iceland before losing 6-1 to host Spain to emerge as the tournament's Cinderella story. Their success was even more remarkable considering the team was only set up in 2014 and can only practice an average of three hours a week on ice. The rest of its practice time is spent on roller blades at a roller rink because of Taiwan's lack of facilities. Woden Sun (孫經武), general secretary of the Chinese Taipei Ice Hockey Federation (CTIHF), told CNA in March that the women's team can only practice at Taipei Arena once a week after it closes at 9:30 p.m.
And that hasn't changed since their recent stellar performance at the Women's World Championships. But as much as more ice time would be appreciated, the team right now would be happy with a touch more recognition. "We just want to have more people know about the sport, and hopefully with the recent success, that might happen soon," Sun said. This is the reality for winter sports athletes in Taiwan, a sub-tropical island where snow rarely falls and ponds and lakes never freeze up. In such an environment, knowing about winter sports is already a stretch, let alone participating in them. Taiwanese may occasionally get a glimpse of winter sports events on TV, but even this year's Olympic Winter Games in Pyeongchang, South Korea were only available on an MOD (multimedia on demand) sports channel not carried by all cable systems. There have also been few Taiwanese athletes competing in winter sports at the highest level who could capture the imagination of local fans. Taiwan had one of the smallest delegations of any team in Pyeongchang, with only four athletes. Three were speed skaters -- Huang Yu-ting (黃郁婷), Sung Ching-yang (宋青陽) and Tai Wei-lin (戴瑋麟) -- and one was luger Lien Te-an (連德安). The 23-year-old Lien, who carried Taiwan's flag during the opening ceremony in Pyeongchang, knows better than anyone how lonely it can be to be a winter sports athlete in the country. 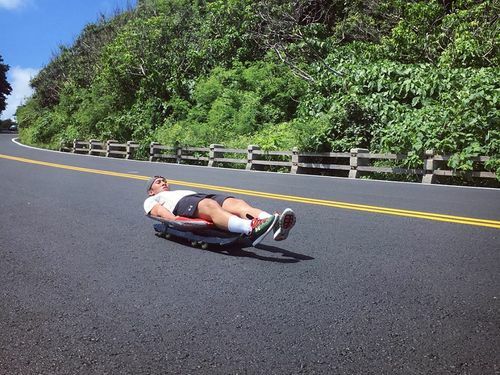 The lack of attention means little or no funding, which has limited Lien's training on luge tracks to visits to Japan or Korea once or twice a year. When in Taiwan, Lien can only stay in touch with the sport by swapping his luge for inline skates and practicing on steep mountain roads, trying to replicate the sensation of riding a flat sled careening down an icy track at top speeds of 140 kilometers per hour. Lien said that not able to practice on ice more often definitely took a toll on him and made it hard to improve, as seen in his results. He was named one of world's best young luge riders after competing in the first-ever 2012 Winter Youth Olympic Games held in Austria, and qualified to compete at the 2014 Winter Olympics in Sochi where he finished 39th in the men's singles luge. But he finished only a place higher at Pyeongchang this year. After competing in South Korea, Lien now wants to take some time off to decide his future direction. 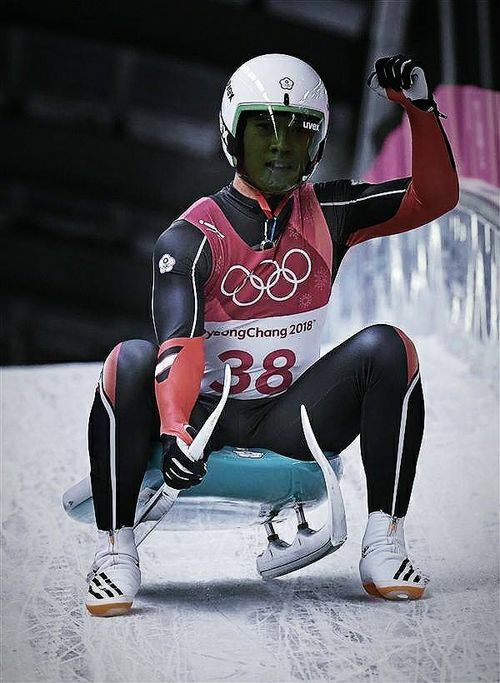 "Obviously, luge is not a popular sport in Taiwan, and I'd like to take a break in the coming months to do some thinking and explore other options," Lien told CNA. Though feeling largely ignored in Taiwan, both Lien and the women's national ice hockey team are doing everything they can to help their respective sports grow locally. Sun said the ice hockey-playing population has been growing in Asia, and with the next Winter Games to be held in Beijing in 2022, he expected more Asian countries to invest money in the sport. According to Sun, most ice hockey players in Taiwan started as speed skaters, and they are generally residents of northern Taiwan because there are no ice rinks in the central and southern parts of the country. He hoped the government can help build more international standard ice rinks here, which would not only help the development of ice hockey but other winter sports. As for Lien, though he is considering other sports options for his own career, he has not given up on nurturing young lugers in Taiwan. He was recently elected as a board member of the Chinese Taipei Luge, Skeleton and Bobsleigh Association, and said he hopes to use that platform to arrange for more athletes to train overseas. "I hope we can fund our young athletes to stay overseas for training and competitions year-round instead of only once or twice a year as was the case for me," he said. He is also pushing for the association to come up with more concrete training projects and goals for each athlete with the 2020 Winter Youth Olympic Games and the 2022 Beijing Winter Olympics on the horizon. One concrete step taken so far is that the association recently joined hands with the New Taipei-based HungKuo Delin University of Technology to establish the school as a center for nurturing luge talent. This is just one of the projects aimed at helping Taiwanese to better understand and become familiar with winter sports, Lien said. "The more people understand the sport, the more they will be interested in it," he said with confidence, even if the odds remain against him and others like him in Taiwan dedicated to promoting winter sports.